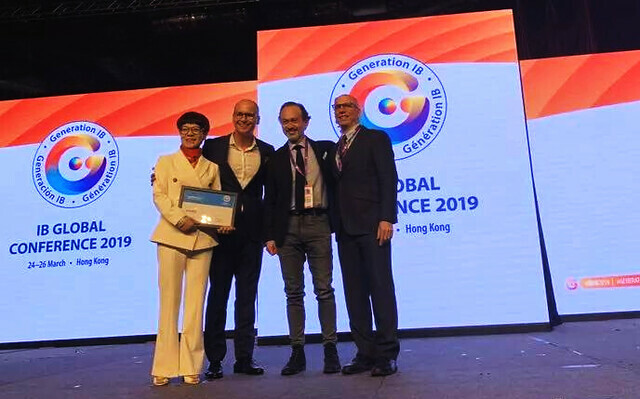 It was an honor to participate in the keynote speeches at the recent International Baccalaureate Global Conference in Hong Kong. My job was to guide a question and answer session with Michael McQueen, the author, speaker and future trends expert. During his speech, the audience could send questions via the conference app. It was a bit of a challenge to have an intimate, informal conversation with him in front of over 1,800 educators, but we managed to do so. His talk was well received and got me thinking about the direction that education needs to take. McQueen feels we are in the midst of a technological revolution as great as the printing press or the start of the Renaissance, and educators need to prepare students to be ready for an ever-changing landscape of work and society. Michael, Ally and I after the keynote session was over! It was also funny that Michael and I being two, bald white guys, looked so similar on stage! Several people commented on the fact after the talk. Ally Wu, the head of the Shen Wei International School in Shenzen, China also gave a talk about how hard it was for her, growing up and working in a Chinese educational system, to start an international school. She showed the human side of China’s rise to the world stage. It was good to get our school’s name out there at such a large gathering of IB educators. Public speaking can be nerve-inducing, but as with anything, the more times you do it, the more comfortable you feel. I look forward to trying it again! I am attending the International Baccalaureate Global Conference in Hong Kong this week. 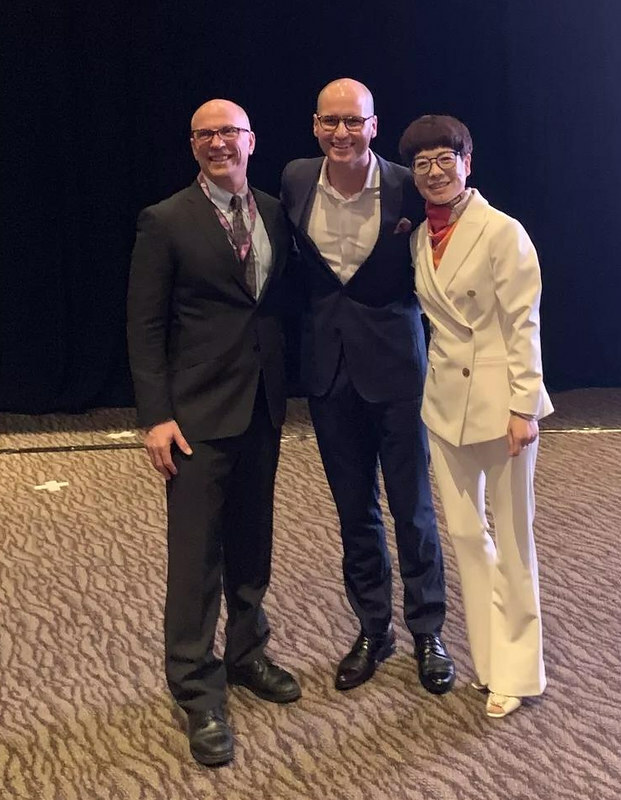 It has been energizing to connect with old friends and new in the IB World. I hope to do a couple of blog posts from the conference to help me reflect and act upon my learning from the conference. Yesterday I attended a presentation by teachers from Discovery College, an English Schools Foundation school located near Disney Land here on Lantau Island. The title was “Building International-mindedness thru Locally-grounded Interdisciplinary Studies”. Their “Big Week” initiative is an off-timetable, week-long MYP Interdisciplinary Unit (IDU) for all MYP students from Year 1 to 5. Big Week involves the students proposing Big Ideas to solve Big Problems. All units focused on understanding their local environment and culture better, the dynamic islands of Hong Kong. I was impressed with the amount of planning it took to make this a reality. Besides sending teachers to official IB IDU workshops and inviting an expert of problem-based learning Harvard’s Project Zero, they devoted a couple of days of in-service planning. The time invested paid off as they have a newly established tradition that just needs some tweaks now. A big benefit was raising awareness of local customs, cultures, pride and community members seeing parts of Hong Kong they have not done so. In reflecting upon the projects they value learning over assessment, there are no inquiries less rigorous than others, avoid contrived links and not to have an exhibition overload. Finally, it is not about ticking boxes for accreditation, but authenticity in teaching and learning. The second workshop I attended was put on by the International Diagnostic and Admissions Test (IDAT). This is a new company that produces admissions tests K-12 that international schools can use to determine classroom readiness. Leading the workshop was Heidi Reid, principal of Times Academy in Sydney. The opening keynote speaker at the EARCOS teachers conference this year was Dr. Greg Dale of Duke University. He recently published, Catch and Release: Becoming a teacher who changes lives. The book title is a play on the metaphor of fly fishing. It is a difficult challenge to catch a trout via fly-fishing. Some students are difficult to reach as well. We catch them as teachers and then we release them on their journey to the next school year. This is a good metaphor to inspire us when working with challenging to “tough-to-catch” students. He is a sports psychologist and with one of the themes of this year’s conference being physical education, he is an appropriate choice of speaker. His big message was to focus on the why you are teaching and not the what or how. When you focus on your purpose, you bring passion and energy to whatever you do. Do we make class drudgery fun and challenging? He asked all of us to write our “whys”. Why do I lead international schools? To make a positive difference in the lives of students, teachers and parents. To guide them to be their best self and find meaning in their lives. He had the crowd laughing with 5 Seasons of a Teacher. Finding a balance between accountability and empathy. I think I and most educators lean too much towards empathy and we need to reminded to hold others accountable, both students and colleagues. The difference between Respect and Dignity. A human life has dignity, but respect needs to be earned. Like the Creating Cultures of Thinking book I am reading by Ron Ritchart, leaders needs to focus on language. Use more “We” and “Our” instead of “I” and “my”. Instead of “have to”, use “get to”. SOIS will be hosting the Kansai Round of the World Scholar’s Cup (WSC) on May 4-5, 2019. Daniel Berdichevsky, the founder of World Scholar’s Cup recently released introductory videos to the events that take place at a WSC event. All middle school and high school students from schools in the Kansai region of Japan are invited to participate. For more information check out the Facebook page for the event or attend the information meeting on Friday, March 8, at 5:00 PM at the Osaka International School theater. Below are introductory videos on the four events featured at World Scholar’s Cup events. This weekend we hosted Dr. Christopher Liang, a professor of psychology and counseling from the Lehigh University College of Education. Dr. Liang led a group of more than 50 educators from around the EARCOS region for two days and then followed up with one day with our faculty. There was much to take in and I am posting my full notes from the conference below. I will try to summarize my big “take-aways” from the workshop in this blog post. A focus this year at OIS is student well-being which includes mental, emotional, and physical health. Pastoral care or social-emotional teaching and learning are more effective within a Multiple Tier School-wide Support (MTSS) program. “Tier 1 for Everyone” is the part of the MTSS that is preventative instruction for all students and for about 80% of the students, meets their needs. The key to a strong school culture of well-being starts with close, healthy relationships. This can be teacher-student relationships, teacher-teacher, and any combination of stakeholder groups in a community. Dr. Liang covered a lot over the three days, raising awareness of mental health and the mitigating factors schools can implement to minimize risk. Some topics included the effects of stress, Third Culture Kids, depression, mindfulness, “hikikomori”, brain education, vocational education, demonstrating care, the impact of culture & identity, and dealing with emotions, among others. One of my main learning points is the relationship between vocational education and well-being. The stress of having a lucrative career drives families to strive for selective universities, high IB scores, etc. When students and parents have more information about career paths, this can lessen these pressures. MindfulSchools – Online training programs for teachers, parents and mental health professionals. A Still Quiet Place – A mindfulness program for teaching children and adolescents. Relationship Matters – A TED talk by Dr. Gordon Neufeld. In the Winter 2018 issue of the EARCOS Triannual Journal: A link to educational excellence in East Asia, OIS Humanities teacher Tara Cheney published an article about her classes here at OIS. The grade 10 and 11 students investigated the renovated Osaka International Peace Museum. The students developed critical thinking and analytical skills to reflect on what the museum offers the public regarding World War II history and Japan’s role. The East Asia Regional Council of Schools consists of 170 international schools serving over 140,000 students in the region. The journal has a wide circulation. Teachers share ideas and best practices. The OIS project will inspire EARCOS faculty to do similar projects in their region. Congratulations to Ms. Cheney and her history students! Read December’s OIS Educator Online! Read Tango, the voice of SOIS students online! New issue out today! I continue to work on my video editing skills. The scenes are from the annual Senri & Osaka International Schools of Kwansei Gakuin Winter Music Concert held on December 6, 2018 in Minoh’s Maple Hall. Grade 12 Dian “Andy” Guan produced this video as a Creativity, Action and Service project. His goal was to reflect upon his classmates’ experiences and opinions about the International Baccalaureate Diploma Programme (IBDP). You can find more information about our DP programme and offerings at our website. In listening to our students, I am always so impressed with their poise, presentation, vocabulary and creativity. I think hearing directly from them gives our community and others, a good idea of the type of school we are and are striving to be. Would you agree the IB is a very rigorously challenging program? What is your biggest source of stress? How do you reduce it’s impact on you? Are you active in extracurricular activities? What skills have you developed from the program? What advice would you give to someone just entering the programme? I would like to thank Andy for sharing the video with us and the students who answered questions and help with the technical aspects of the video.